Statement: By this time I had become able to use narrow strips made from many small pieces arrayed diagonally to create delicate feelings. The design came quite naturally from particular viewpoints of some attractive places inside of my favorite temples. In Japan we often see a small cottage or garden through a bamboo fence or screen; the image often is more attractive than what we would see without the bamboo. 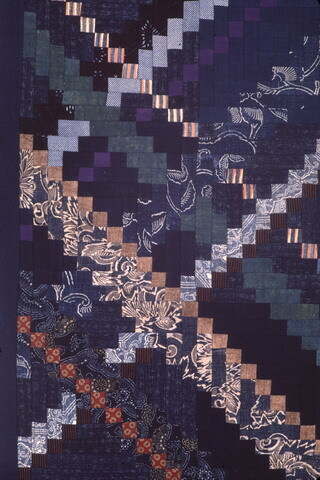 The background suggests a kind of screen with gold or silver colored paper squares, realized with several different shades of dark blue (aizome).